I like baking breads at home and my interest of baking includes combination of different and healthy ingredients. I always try to bake something different from regular breads so as to get a variety in our diet. Teff is one of the healthiest and newest ancient grains that’s super healthy, high in fiber, iron rich and along with being gluten free it has sufficient amount of essential amino acids too. I have been trying few recipes with this super delicious grain and finally I came up with a combination of teff flour, wheat bran and chia seeds. Now you can imagine the health benefits of this bread with the super foods combined together and baked into beautiful and flavorsome sandwich bread. 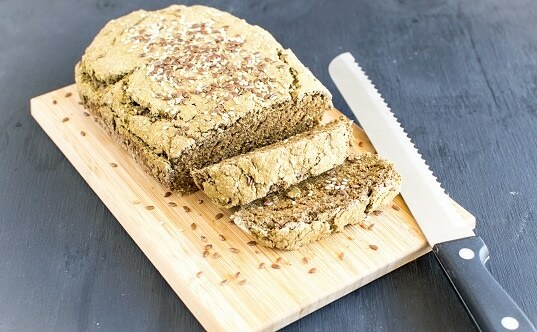 I combined Teff flour (for nutrition), wheat bran (for fiber), soaked chia seeds to substitute egg (to make it a vegan bread), walnut oil for making it moist and lightly sweetened with maple syrup, topped with white sesame seeds and flax seeds. Doesn’t that sound a wholesome meal……My breads are always a kind of one meal 🙂 One slice of Teff Wheat Bran Chia Bread is a complete breakfast. The best part about this bread is that too much kneading isn’t needed so obviously less labor and no babysitting needed, that means while the bread is baking you can finish other chores or just relax in front of the television with a cup of coffee and increase your temptation for this bread as the delicious aroma circulates all over your house 🙂 until the timer goes off. Every morning religiously…no matter how hectic it is for us to be at our respective work places…which includes Yashvi’s school…we all sit at the breakfast table and eat together and Teff Wheat Bran Chia Bread is our recent favorite. While the tea gets ready I quickly toast these bread slices and enjoy with jam, butter, tofu scramble or sometimes with just tea/coffee. We love our morning routine and make sure we follow it every day and I simply look forward to start each day seeing smiling and happy faces in my house which encourages me to create more nutritious and healthy recipes with unique and exclusive combinations. Preheat oven at 400 degree Fahrenheit and prepare a bread pan by greasing and dusting it. In a mixing bowl combine teff flour and wheat brans. Mix properly with a spoon. Add baking powder, baking soda and salt to it and mix very lump so that there are no lumps. Add all the ingredients (except water, sesame seeds and flax seeds). Mix with hands so well that the flour is well combined with all the ingredients. Now, slowly add water to it making it into soft dough (tortilla like dough). Roughly shape the dough according to the bread pan size without pressing too much. Top it with sesame seeds and flax seeds and place the pan in the middle section of the oven. Bake it for 35-40 minutes until the tester comes out clean and the bread is crispy from outside. Turn off the oven. Take out the bread and cool it for few minutes. Cut into your desired slices and enjoy with any spread of your choice. Don’t worry too much about the shape of the bread. Make a rough oblong shape. When topping it with the seeds gently press the seeds so as to stick to the bread. Store the slices in an air tight container in a room temperature for a week. When soaking chia seeds in 3/8 cups warm water soak only for few minutes till the seeds soften and rise. Love making homemade breads and have never tried this one before. Will be adding this to the make list. YUM, that looks so good! I love a nice protein and fiber-filled bread! This bread looks absolutely scrumptious!